Lay out bacon on a sheet pan and bake at 350°F for 12-15 minutes. Bacon should be cooked, but not crispy. 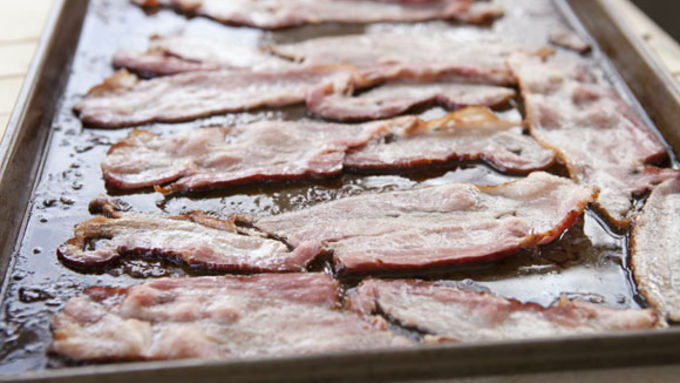 Remove bacon and let drain on a paper towel to pull off the grease. 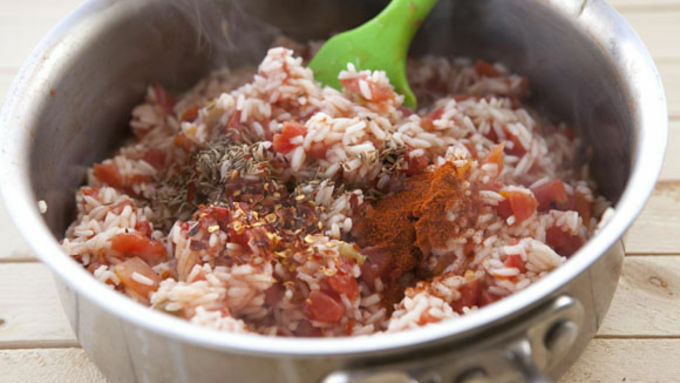 In a medium pan, add rice, water, and tomatoes. Bring to simmer and cook, covered, until rice is cooked and liquid is absorbed, about 15-20 minutes. Add spices and season with salt and pepper. 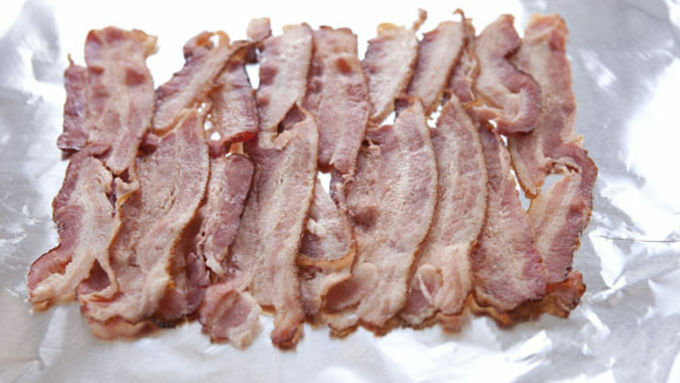 When bacon is cool, lay strips out on some foil so that they strips slightly overlap one another. Add a thin layer of spanish rice to the bacon, leaving about 1/2 inch around the edges of the bacon. You won't use all the rice. 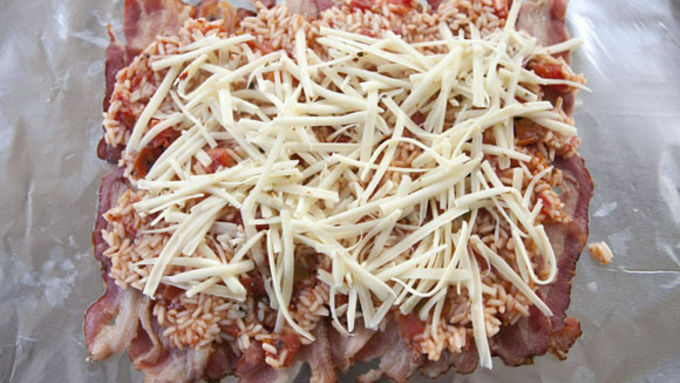 Sprinkle rice with grated cheese. 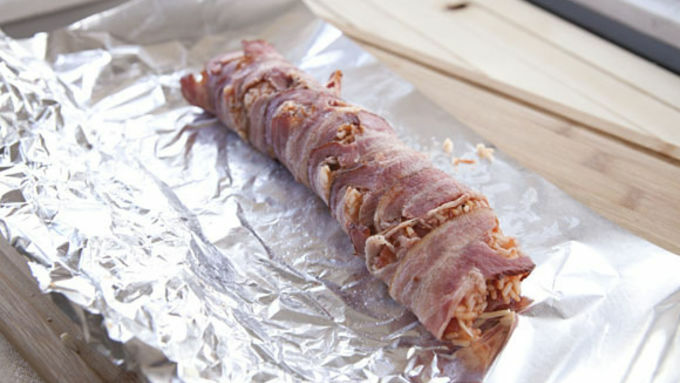 Use foil to carefully roll bacon into a tight tube around rice. Work slowly and be careful not to rip the bacon exterior. Once the bacon is rolled tightly, transfer back to the baking sheet. It's easiest to just lift if using the foil. 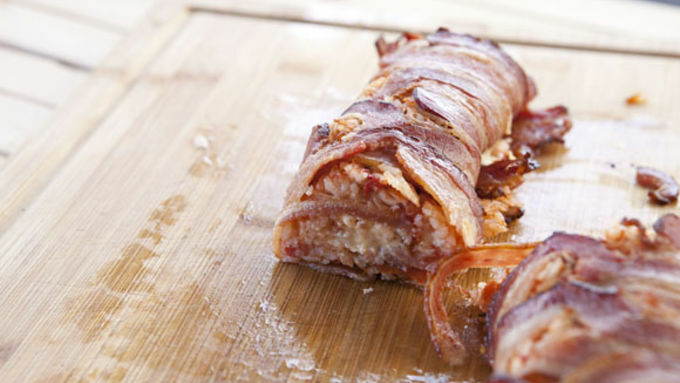 Bake bacon sushi at 350°F for another 15-20 minutes until bacon is very crispy. Let cool for a few minutes and slice into 8-10 pieces. 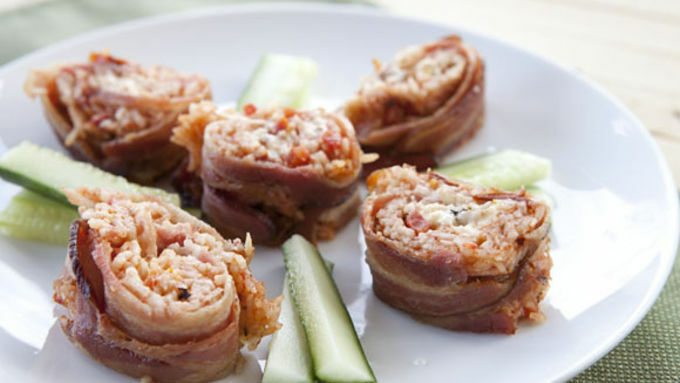 Serve large bacon sushis with chopped cucumbers or other crispy veggies. I had this moment while making this dish—a cross between glee and terror. 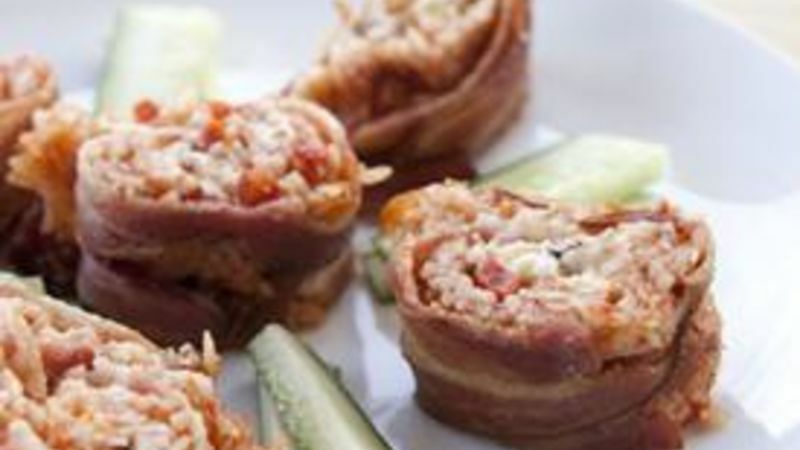 I had no idea if bacon sushi would actually work, but I knew that if it did…it would probably be delicious. It did require a bit of patience and some finesse, but bacon-wrapped sushi can be done. When you stuff it with seasoned Spanish rice and melted cheese you get something that I’m sure falls squarely outside of most traditional cuisine. It falls squarely into goodness though. No doubt about that! I kept the rice filling pretty simple and just cooked some short grain white rice with a few cups of water and a can of diced tomatoes. Add in spices and season the rice to your liking. Okay. On to the tricky part – the bacon! Before you wrap the bacon, you want to cook it halfway to cook out some of the fat. You wan to leave them cooked, but not crispy at all. When it comes time to roll this sucker, take a deep breath! 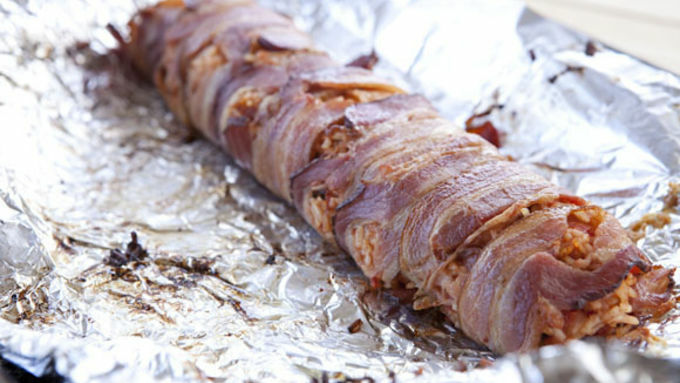 Work slowly and use the foil underneath the bacon to roll the bacon into a tight tube. You should be able to get it nice and tight so the bacon holds in the entire filling. These sushi pieces are very rich and one or two of them is a great snack. Serve them with some crunchy veggies to cut some of the richness of the rolls. No doubt about it, these involve an advanced bacon prep situation, but they are really tasty actually and definitely a show stopper!